The three-man crew of the International Space Station plays a cosmic prank on Mission Control on April 1, 2010, April Fool's Day, with a doctored photo of themselves in space without spacesuits. Full story. 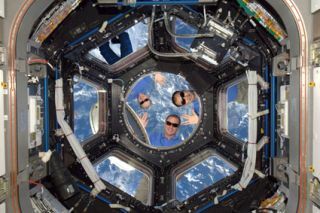 The three astronauts living aboard the InternationalSpace Station beamed a snapshot of themselves floating in space withoutspacesuits Thursday in an out-of-this-world April Fool's Day prank on MissionControl. In the fake spacewalk photo, the three astronauts arefloating outside the space station's largest window, waving hello while wearingnothing but t-shirts, slacks and sunglasses. "You have a real problem, but you know it's outsideour capability to help you," astronaut Shannon Lucid radioed the stationcrew, laughing all the way. The astronauts told Mission Control not to worry, though.They were indeed wearing sunscreen, eye protection (the sunglasses) and weresecurely tethered in the photo so they wouldn't drift away. Also, it was all in good fun [howApril Fool's Day began]. "We wanted to welcome you guys to April, andhopefully we brought you guys some smiles and not a lot of nervousness,"station astronaut Timothy "T.J."? Creamer of NASA told MissionControl. "You brought a lot of laughs, that's for sure,"Lucid replied. The International Space Station is home to three astronautsfrom three different countries. In addition to Creamer, an American, theoutpost is staffed by Japanese astronaut Soichi Noguchi and Russian cosmonautOleg Kotov, who is commanding their Expedition 23 mission. Spacejokes aside, the three station astronauts are about to get really busy,really fast. A Russian Soyuz rocket is set to blastoff early Friday carrying three new members of the space station's crew.Those new additions, two Russians and one American, will arrive on Sunday, oneday before NASA's space shuttle Discovery is due to launch on its own missionto the space station. If all goes well, Discovery will arrive at the station onApril 7, just days after the Soyuz, during a planned 13-day mission to deliver27,000 pounds of supplies, cargo, science experiments and other gear. Threespacewalks are planned. When Did April Fool's Day Begin?